Hope Mining Company (HMC) is available for purchase. Many mining operations are available for purchase across Alaska, but key differentiators make this purchase option particularly attractive. Hope Mining Company is located on Alaska’s Kenai Peninsula – 14 air miles and 89 road miles from Alaska’s biggest city – Anchorage – on a road system that directly connects the small, historic community of Hope with Alaska’s largest transportation hub. A 2,000-foot Alaska State maintained gravel runway exists approximately two miles from the main operation along Resurrection Creek. Hope Mining Company holdings include placer (gold in a free state) and lode (gold bearing rock) resources including four miles on both sides and including Resurrection Creek, claims including and along the Palmer Creek Drainage, claims within the Six Mile Creek Drainage and the connecting East Fork tributary. The source of the gold in the placers is the numerous auriferous veins in the mountains in the surrounding area. All mining claims are solely owned by Hope Mining Company and their titles are free and clear of liens and encumbrances. Hope Mining Company has an approved 20 year Plan of Operation with the Chugach National Forest for placer mining operations within the claim holdings. Currently, there are no unusual social, political or environmental encumbrances to exploration, development or production on Hope Mining Company property. Of the Federal Claims Hope Mining Company owns, 42 have been surveyed as part of a patent application. Approximately 750 acres are in the patent application, but 1,000 acres are land surveyed. The Clinton Administration imposed the patent moratorium and subsequent Administrations have yet to rescind it. The Federal Claims are administered by the Chugach National Forest of the U.S. Department of Agriculture. The State Claims are administered by the Alaska Department of Natural Resources. Based on Hope Mining Company’s November 2010 Mineral Report, a combination of actual mining, the work of geologists and geophysicists, and extensive magnetometer testing indicate 61,468 ounces of available gold for mining in just the Resurrection Creek drainage mining claims. Estimated Value (March, 2018 prices) of Resurrection Creek gold: $652,000,000. The Resurrection Creek Drainage includes 1,802 acres of claims extending south from the town of Hope to Resurrection Creek footbridge that extend approximately 1.5 miles wide at the southern boundary and as little as ½ mile wide proximal to the town of Hope. These areas include claims along Bedrock, Wild Horse and Cripple Creeks and a few claims along Rimrock Creek, south of the main holdings. The fourteen mile long Palmer Creek Road connects to Resurrection Creek Road just outside of the town of Hope. The Palmer Creek area contains 320 acres of approved mining claims along and including Palmer Creek itself, and the Coeur D’Alene, and Bonanza Creek drainages. Also within the Palmer Creek Drainage are HMC’s Hershey and Lucky Strike/Swetman hardrock mines. These lode claims include two mill site claims that were mined between 1911 and 1939 but have not been in production since. Hope Mining Company’s holdings also include 600 acres of claims along Sixmile Creek and the attached East Fork tributary. These claims are accessible from the Hope Highway and the Seward Highway respectively. The East Fork claims are characterized by complex geomorphology of benches, former sub-glacial channels and a gorge. East Fork Claims lie in a shallow rock-walled canyon cut through the grits and arkoses of the area and are overlain by gravel. The gravels continue through the upper valley and appear as well-formed terraces. In total, Hope Mining Company owns 2,122 acres of federal claims and approximately 600 acres of state claims on the northern end of Alaska’s Kenai Peninsula. Primary mining infrastructure exists within the Resurrection Creek holdings, three miles of which are only accessible through locked gates. This infrastructure includes an extensive settling system of established French drains, ditches and 33 settling ponds. A network of 9.5 miles of established mining access roads and an unquantified length of ATV trails connects the claims in the Resurrection Creek area. The fourteen mile Palmer Creek Road allows access to the claims in that area, and the East Fork and Six Mile claims are accessible along the Seward and Hope Highways. Four approved equipment fords allow access to claims on the west side of Resurrection Creek. Two hand-pulled trams allow access across Resurrection Creek during high water events and Hope Mining Company has a permit for ATV crossing on the Resurrection Creek Footbridge. Current, approved plans of operation include the ability to install a heavy equipment grade bridge across Resurrection Creek with bridge abutments already in place. Within the Resurrection Creek holdings and within the three miles between HMC’s locked gates are 10 established mining camps associated with various mining areas. Camp 1 consists of a historic 2-room log cabin with kitchen and bunks, a shower building, a four-bunk bunkhouse, a historic log cabin tool shed and a gold cleaning room. These facilities are on Resurrection Creek Road at approximately Mile 3.2. Camp 2 includes a muster point and gathering area, a bath house with shower, toilet and sink and a four bunk bunkhouse with two rooms including a kitchen. Camp 3 includes a contained bulk fuel storage area with a total of 3,000 gallons of storage in four tanks, a generator shed and generators that power Camps 1 through 3 and various storage (Connex) containers and a secure gold cleaning room. Camp 6 consists of a two-room cabin with a kitchen and storage facilities and a septic system. Camps 2, 3 and 6 have leach fields (septic systems). Sourants Camp on the west side of Resurrection Creek includes a two-bunk bunkhouse with a cook stove. All camps include aromatically controlled gravity-flex toilets (outhouses) with manually dispensed microfilament sanitizing stations (toilet paper roles). Other mines in Alaska’s interior and elsewhere around the state require extensive travel, often combining driving and flying and significant logistics, resources and expense to get mining equipment and supplies in and out of these areas. Hope Mining Company is proximal to Alaska’s biggest city on an established road system two hours driving time from Anchorage. 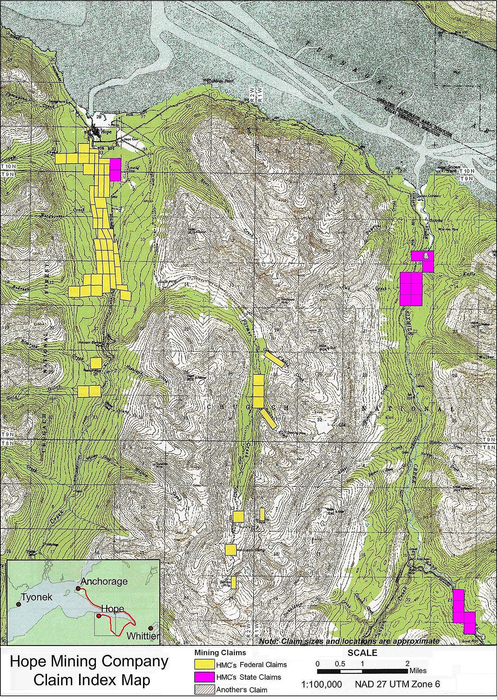 Extensive magnetic surveys and other mineral assessments and testing indicate many anomalies, which point to significant gold reserves in this easily accessible area. A 2,000-foot Alaska State maintained gravel runway exists approximately two miles from the main operation. The primary locus of operations are behind locked gates. Road access within the claim holdings is permitted in a road-less forest. A 20-year operating plan is in place and infrastructure exists to support a shovel or dozer-ready operation. Patents are on file with the US Government for a significant portion of the holdings along the Resurrection Creek drainage claims. In addition to proven resources, significant cultural and historical resources are part of the overall value of the Company. Hope Mining Company qualifies for inclusion in the Federal Natural Historical Register. Hope Mining Company is a member in good standing with the Better Business Bureau and is part of the Alaska Miner’s Association. Contact us at (907) 250-6184 or (907) 441-7006 for additional detail and terms of purchase. Hope Mining Company provides gold mining opportunity on the Cook Inlet side of the historic Resurrection Creek Drainage that terminates in the historic mining town of Hope, Alaska.